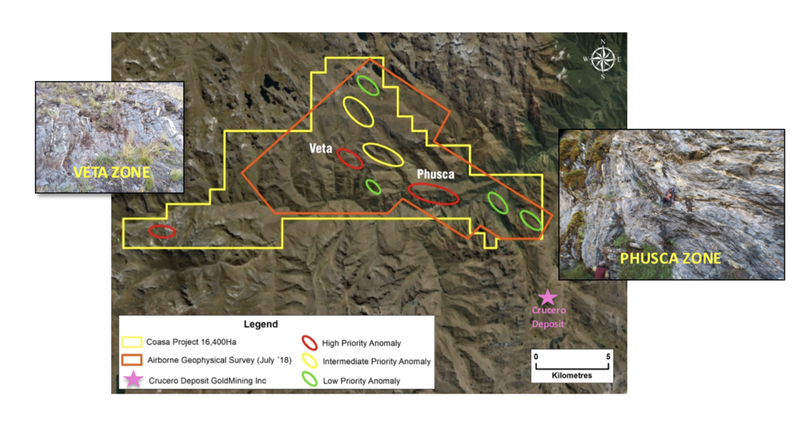 Palamina has discovered a new orogenic gold zone in the Veta target area at its Coasa Gold Project in south-eastern Peru. At Coasa nine separate orogenic gold anomalous target areas have been prioritized into low, intermediate and high priority anomalies. Palamina´s latest sampling campaign focused on gaining an understanding of the potential of the highest priority Phusca and Veta anomalies. At Veta recent mapping and surface sampling resulted in the discovery of an open-ended 400 by 300 metre-wide anomalous gold zone. Visible native-gold was identified in veinlets at surface within a prospective, deformed structure which shows no historic mining activity. Individual grab samples reached a high of 39.2 g/t gold with a 7 metre long chip sample returning a grade of 4.2 g/t gold. Within the 240 metre wide central corridor a total of 119 samples were assayed where 27.5% of the samples returned values greater than 1.0 g/t gold. Results from this early-stage of geochemical sampling cannot be considered to be representative. Follow-up continuous channel sampling is being carried out in the current field campaign to better understand the significance and potential of the newly discovered gold mineralization. To date a total of 9 anomalous targets areas, including Veta, have been identified at Coasa. At the Phusca target, located some 5 km southeast of Veta, anomalous gold values and strong pathfinder geochemistry results have been obtained from prospecting activities. The open-ended Phusca anomaly extends over some 2 kilometres of strike and hosts several geological features characteristic of individual orogenic gold deposits located in the gold belt. At Coasa, Palamina holds title and application mining rights to 16,400 hectares. The Coasa Gold Project was initially staked to investigate a geologic environment interpreted to be similar to that of the Ollachea orogenic gold deposit. Members of Palamina’s geological team formed part of the exploration discovery team at Ollachea. The Ollachea deposits are focused along a structurally deformed east-west trending regional shear-zone. Palamina is also investigating the >17-kilometre-long regional shear zone that spans the Coasa project as a possible extension to the shear zone that hosts GoldMining Inc’s Crucero Gold deposit to the south. Crucero hosts a 1.0 Moz indicated and 1.03 Moz inferred gold resource. Palamina has conducted numerous field campaigns and studied satellite photos in order to establish that the shear zone hosting the Crucero Gold Deposit may potentially extend onto Palamina’s Coasa project. A >3,000 kilometres Heli-borne geophysical survey over 3 of Palamina’s properties including Coasa is scheduled to commence in July 2018 in order to locate and better understand structural extensions to known gold deposits. In the Puno Orogenic Gold Belt, the presence of magnetic pyrrhotite occurring in association with mineralized gold-bearing structures has been confirmed at several potentially economic gold deposits. A total of 1,234 line-kilometres will be flown at Coasa over 129 square kilometres at 125 metre line spacing as well as an additional 15 square kilometres at 250 metre line spacing. Mr. Donald Mc Iver, M,Sc Exploration and Economic Geology, a Fellow of the Australian Institute of Mining and Metallurgy (FAusIMM), as well as the Society of Economic Geologists (FSEG), is Vice President Exploration for Palamina Corp. He is a Qualified Person as defined by National Instrument 43-101 and he has supervised the preparation, compiled and reviewed the geological and technical contents of this press release. Palamina has acquired the application and mining rights to five gold projects in south-eastern Peru in the Puno Orogenic Gold Belt (POGB), one copper-gold project in the coastal I.O.C.G. belt in Southern Peru and holds 100% interest in one exploration project in Mexico. Palamina’s Peruvian based exploration team have a cumulative 35 years’ experience in the POGB and are supported by a board of directors and advisors who are proven mine finders, deal makers and financiers. Palamina has 29,621,381 shares outstanding and trades on the TSX Venture Exchange under the symbol PA. This news release contains certain “forward-looking statements” within the meaning of such statements under applicable securities law. Forward-looking statements are frequently characterized by words such as “plan”, “continue”, “expect”, “project”, “intend”, “believe”, “anticipate”, “estimate”, “may”, “will”, “potential”, “proposed” and other similar words, or statements that certain events or conditions “may” or “will” occur. These statements are only predictions. Various assumptions were used in drawing the conclusions or making the projections contained in the forward-looking statements throughout this news release. Forward-looking statements include, but are not limited to, the use of proceeds of the Offering and the Company's future business plans. Forward-looking statements are based on the opinions and estimates of management at the date the statements are made, and are subject to a variety of risks and uncertainties and other factors that could cause actual events or results to differ materially from those projected in the forward-looking statements. The Company is under no obligation, and expressly disclaims any intention or obligation, to update or revise any forward-looking statements, whether as a result of new information, future events or otherwise, except as expressly required by applicable law. A more complete discussion of the risks and uncertainties facing the Company appears in the Company’s continuous disclosure filings, which are available at www.sedar.com.